Career Voyage works on talent development for both individuals and businesses. For individuals they bring strategic focus to people at critical points in their careers, helping them discover their options and steering a career to where their talents are best suited and rewarded. For businesses, they work with them to make the most of the talent they have in-house, as well as helping to attract top class new talent that may be required by the employer. After working with Amanda Shufflebotham of Graffik Heart on their logo and illustration style, Career Voyage approached me to look at expanding this into website design, as well as other materials such as Powerpoint presentation style and setting up graphic content for their social media channels. Career Voyage had the start of a logo and a great illustration style, which needed strengthening and progressing to work clearly in a digital environment. 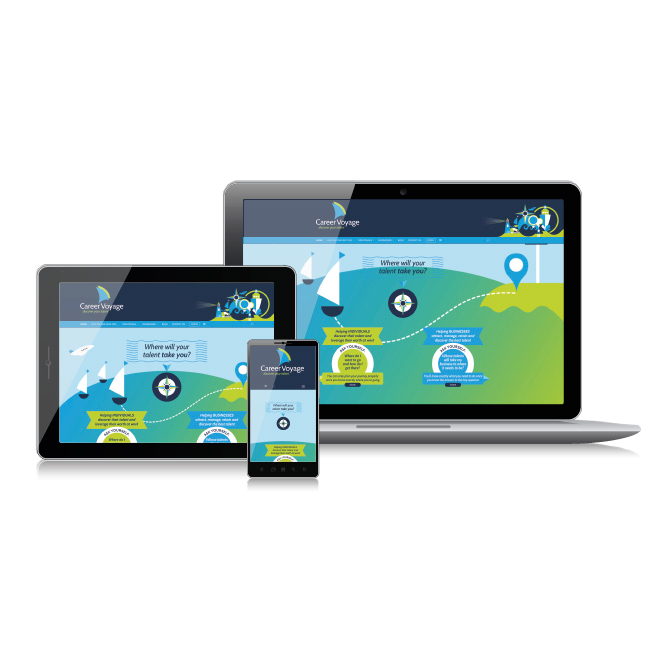 The website design required an engaging homepage and then key inner pages which would easily split the individual and business offerings, giving clarity to pricing tariffs. Page designs were also completed for standard content such as ‘About Us’, ‘Customer Stories’ and ‘How we can help’. Key to describing the two offerings was colour-coding and iconography throughout the site. Icons had to sit with the travel voyage theme, colour and brand whilst helping to convey particular offers and processes that Career Voyage would take clients through. The site was built in WordPress by web developer Iain Claridge – coded to be fully responsive on smartphones and tablets as well as laptops and desktop computers. Look, feel and brand style were then rolled out across Powerpoint presentations and social media sites including LinkedIn, Twitter, Google+ and a Facebook company page.